Between the generous amount of green beans and the homemade silken tofu mayonnaise, this vegan recipe is a lot lighter than your average potato salad. It makes a goodly amount for a potluck or picnic, with no egg safety issues to worry about when transporting it. Sunflower seeds are optional but I like the little bit of texture and nutty flavor that they add. This time of year it’s easy to find a bunch of fresh dill and add a few snips, but you can substitute a smaller amount of dried dill if necessary. I’ve been playing with this recipe for a while. Last year’s version had a few extra ingredients like celery and cherry tomatoes and got packed along to Wooden O’s Shakespeare in the Park. Catching their two outdoor plays each summer has become a fun family tradition for us. I’ll be sure to make up and bring some of this salad on our picnic this year along with the other noshables. 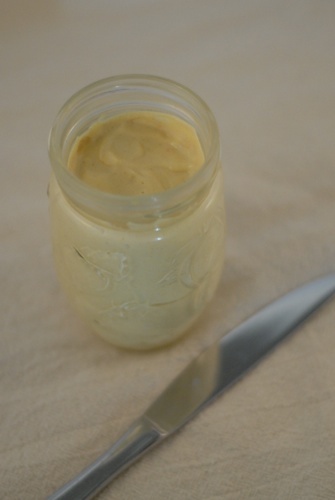 You will need about half a recipe of homemade silken tofu mayo, follow the link above for the recipe. Cook whole unpeeled potatoes in a large pot of salted water. Water should be boiling but not vigorously to avoid breaking up the potatoes. Cooking time will vary (about 20 minutes for small potatoes, 35 for medium-large potatoes). Meanwhile snap ends off of green beans and snap in half. Test potatoes with a fork and when they are done, remove from cooking water with a slotted spoon. Add green beans to the water and cook for seven minutes. Drain pot through a sieve to catch the cooked green beans. Let potatoes cool, then cube. I usually leave the skins on, but you can remove them after cooking if you like. Combine potatoes, green beans, dressing, and additional ingredients. Mix together gently to avoid breaking up the potatoes. This is my first month participating in The Salad Bar Facebook group. 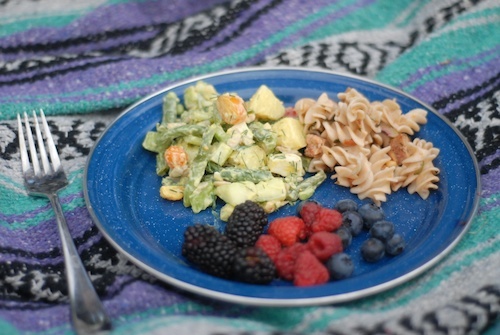 We share recipes for a different type of salad each month: this month’s assignment was a potluck or picnic salad. Check out what other members contributed in the links below. This sounds delicious! 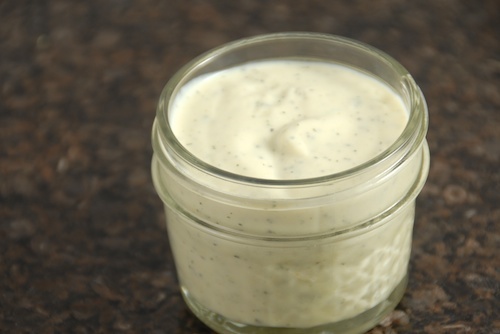 I love that you made tofu mayonnaise instead of using regular mayonnaise. I would have never thought of adding green beans to a potato salad. I bet they give the salad a really nice crunch! 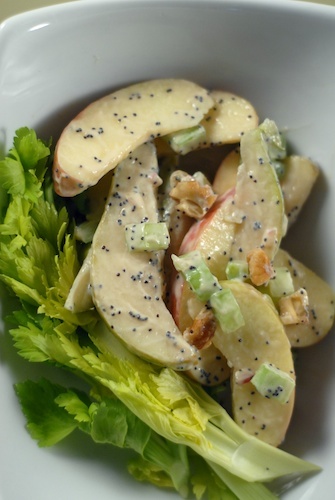 What an awesome way to add greens to a potato salad! I am intrigued by the tofu mayo. Looks delicious! I just love green beans with potatoes. Great idea. I like the idea of the tofu mayonnaise. This salad is perfect for the vegans in the house. i’ve been wanting to try a green bean & potato salad for awhile. love the incorporation of dill in this–it’s one of my fave herbs! I see you posted a potato salad too, great minds think alike! 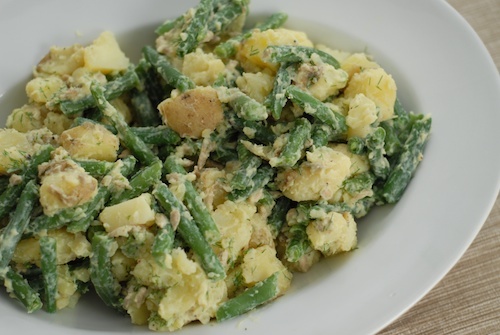 Using green beans in a potato salad is an excellent idea. It cuts the amount of calories needed per serving. 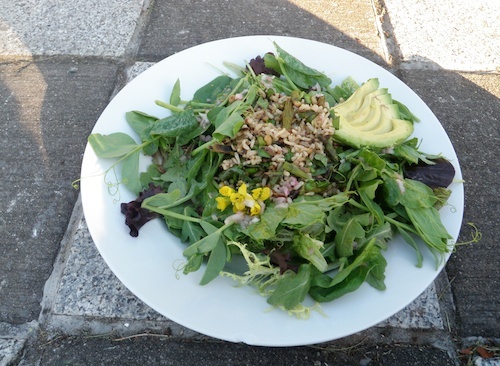 Yes, it is an easy way to make the salad lighter! Green beans and potatoes are a great combo. They sure are, I often combine them! I love the combo of dill and green beans – this looks fabulous! Yum! I’ve never had a green bean and potato salad but it sounds great. I love both things so placing them together is genius! Thanks, Ann! This is the first recipe swap I’ve participated in and I’ve had fun with it, too! Your dilly green bean potato salad looks absolutely amazing. I love the colors… my daughter will go crazy over this one. Thanks, Veronica, I hope your family does love it! I never used to be a big fan of potato salad, especially the mayo-dressed variety, but throw a generous handful of dill on top and that changes everything. I just adore that fresh herbal flavor! Yup, and I love this time of year when big bunches of dill are for sale everywhere! Mostly for the folks making pickles, which I’ve got to try sometime.